It used to be that your fare on an airline included your meal, a seat with some legroom and a reasonable amount of baggage. The prices have gone up and up. Some airlines now charge extra for any baggage. Seems they think even though people are flying thousands of miles away from home they won’t need a change of underwear. They have moved the seats closer together in order to get an additional row of seats. Now your knees rub the back of the seat in front of you. They even stopped providing food and have now started selling deli-style foods for healthy prices, credit card only, no cash exchanged. 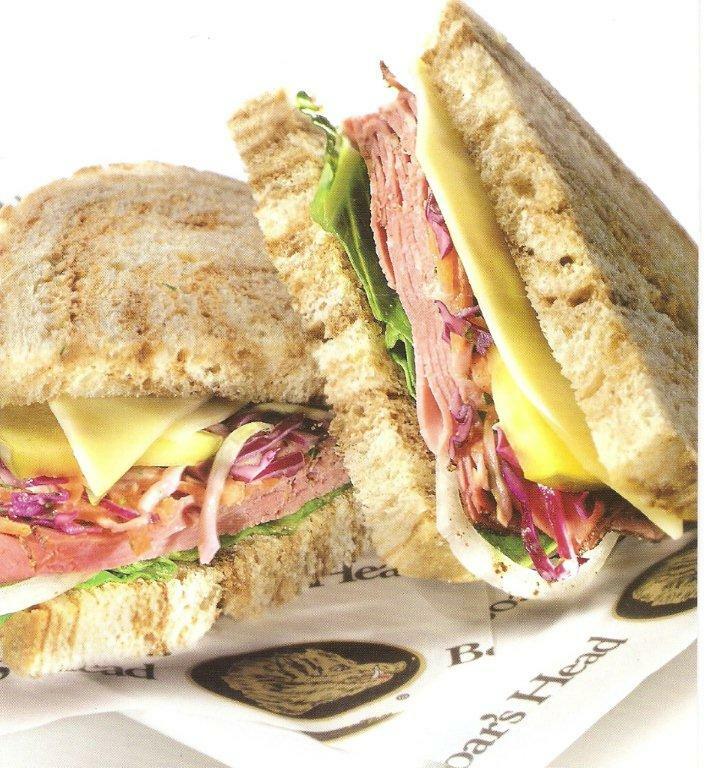 On a recent flight to Alaska, the sandwich was offered on the flight up but was not offered on the flight back. I thought it would be interesting to see if I could duplicate the sandwich. Although I didn’t purchase one on the flight to Anchorage, I was going to compare our version and the purchased sandwich against the menu photo. Unfortunately, the sandwich was not available on the return flight. Our experiment did, however, provide a good tasting sandwich that compared favorably against the menu photo. I hope you will enjoy it too. Prepare ingredients. Remove stem ends of Romaine leaves, slice onion in thin slices. The coleslaw provides the moisture for the sandwich. If wet, darin some of the liquid off to prevent soggy sandwiches. If the coleslaw is very dry, you might have to use a light coating of mayonnaise on the slices of bread. Lay out slices of bread. Arrange lettuce slices on one slice of each sandwich. 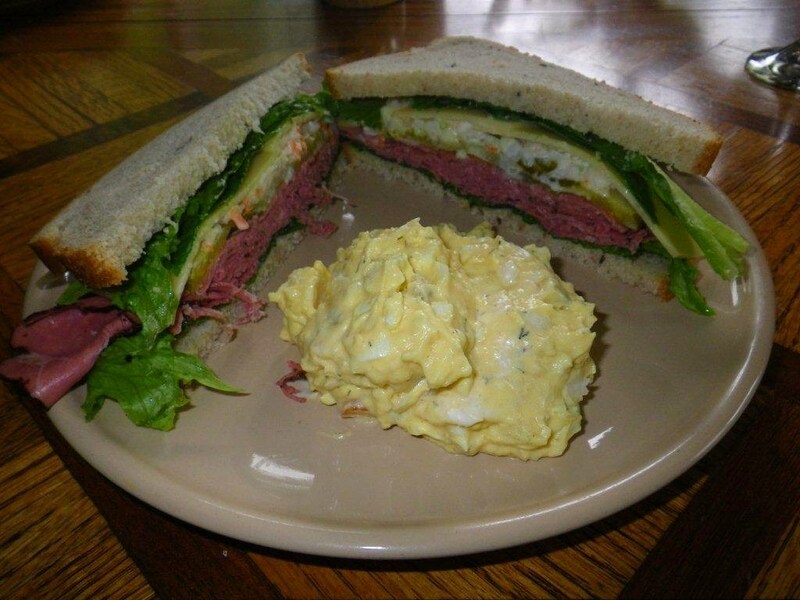 Divide the pastrami among the three sandwiches. Carefully arrange a layer of coleslaw on top of the pastrami. Place onion slices, to taste, over the top of the coleslaw. Place a layer of dill pickles. Cover the sandwich filling with a layer of Swiss cheese and a final layer of Romaine lettuce leaves. Cover with slice of bread. Place two toothpicks through the sandwiches. Carefully cut in half between the toothpicks. Arrange on plate with salad, French fries or chips. Remove toothpicks before serving. Note: Marble rye bread is sometimes hard to find. You may substitute your favoriye rye bread.